You can just tick along. That’s fine. Your choice. I was recently talking to Jonathon Grapsas, Director of flat earth direct about innovation and some of the challenges for the charity sector. He asked me six key questions. And here is what I said. 1. Let’s start with some of the basics. How do you define innovation and do you think most people really understand what it means? I think it’s important to define both innovation and creativity as they are terms that are often used (and overused) together. Creativity is the art of coming up with a new idea – as humans we are all creative. Innovation is ‘taking action’ to make that new idea happen. Innovation can be a radical change, for example the invention of the Internet or digital music or the Amazon model of shopping that changes the way we work. Innovation can also be a small or incremental change that delivers results, for example challenging out of date processes, changing a mail pack or a thank you letter or really interrogating your database. 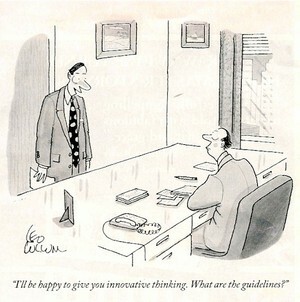 Most people think innovation is a lone genius having a light bulb moment. This is not the case. Innovation is more likely to be a series of connections or ideas put together in new ways, and is often a slow hunch, or a series of slow hunches over a period of time. The invention of the Internet is a great example – Tim Berners Lee was tinkering away for 20 years fascinated about making sense of data before he stumbled across a technology that has changed the world. People also think innovation is just for the ‘innovators’ – that’s also not true. Every single one of us has the ability to be innovative, we just have to work out what areas our creative strengths are in and play to them. 2. As you know everyone talks about the desire to be innovative and agents of change. But very few charities truly are pushing the envelope. What are the biggest things holding us back? Can we rightly point the finger at boards or is this a cop-out of sorts? Charities are great at talking about how they should be innovative but I can’t see many being strategic about developing innovation. We are all held back by fear. Fear of the unknown, fear of failure and fear of putting our heads above the parapet, both personally and professionally. In a difficult economic climate people fear losing their job. Being seen as different is perceived as risky. I think the economic climate is used as an excuse to ‘play it safe’. Some of history’s great innovations were developed in bad economic times including some big names like Motorola, Hewlett-Packard and Xerox. Right now we have a real opportunity to be more innovative to increase efficiencies and income and give our organisations an essential competitive advantage during tough times. Innovation has to be led from the top, look at any company delivering success through innovation. Their leadership deliberately drives a culture of innovation in a range of ways; for example Google 20% time, 3Ms’ strategy to deliver 20% of income through new products and of course Apple who have four times as many apps developers than employees who all work for free and Apple takes 30% of everything they earn. The point is that it’s not good enough to tell your staff to be more innovative, leaders need to walk the walk and insist on time and space for innovation put realistic success measures in place, which are not necessarily income driven and accept that innovation is a mid to long-term game. The responsibility for driving innovation sits at the top. 3. Are there any individuals or organisations we should be looking to that are doing some really interesting, leading edge stuff that’s pushing the fundraising boundaries? What about the corporate world, who’s rocking? In the UK, Cancer Research UK are the only charity I can think of that is strategically developing radical innovation and are developing some great products – My Projects is one that has been showcased recently. That said you don’t have to be a big charity to do innovation, you just need some passion and determination to make the world a better place for your cause. Check out AJ Leon’s Lac project which is an inspiration and watch out for the small guys who have great ideas, and are more agile at trying things out, they just don’t always make the press so are harder to spot. LEGO Cuusoo who are crowdsourcing, pre-market making designs and sharing 1% of revenue with the idea originator and their helpers. McLaren Applied Technologies are commercializing their technology and applying it to other industries. This is now the 2nd most profitable part of McLaren after F1. 4. Do you think we learn enough from our failures within the charity sector? What can we be doing moving forward to better learn from things gone awry? No we don’t learn enough from failure. AND I think it is the single biggest thing that stops innovation. It all comes back to fear. We like to celebrate success and push failures under the carpet. That’s what human behavior dictates and is reinforced in us by society and education systems from an early age. We need to go against the grain and shout about, celebrate and learn from failure. A High Value Donor team that I trained in creativity and innovation took away a new “fail yea” agenda onto every team meeting. Having permission to celebrate failure, made it OK to admit mistakes and shared failures ensured the same mistakes were not repeated. This approach made a big difference to the success of future high value events that had previously failed in some way. Failure has to be encouraged as part of an organisations culture and again, has to be driven from the top. 5. You might have seen I recently blogged about everyone wanting to be second. Why do you think that is? Are we paralyzed by fear? Is this a sector specific thing? Great blog. I think you sum it up. Second is safe. Second is less risky. That’s why organisations like the comfort zone of being second. However in an increasingly competitive marketplace I would agree with Seth Godin’s point in Purple Cow that second is more risky than first. Second is more risky because second is the same as everyone else. Second is boring. If we are going to raise more money we need to be remarkable. First is remarkable. Being second, third, fourth etc. means we are the same as everyone else and that in a competitive world is very risky. We are paralyzed by fear and we need to get over ourselves. Look at any successful entrepreneur; they accept that failing is inevitable. They fail fast and learn. This is a key to their success. Fear of failure is not sector specific, although I think the fear of being seen to ‘waste’ donations is another barrier that further prevents charities innovating. We shouldn’t aim to fail, and it’s important to minimize risk of failure. Do your research, pilot on a small-scale, test and refine. But do something. Your idea might not work and that’s ok because you tried something new. However, it’s not ok for your idea not to work because you cut corners or were lazy. There is a big difference. 6. As someone who spends such a big chunk of time talking about what it means to be innovative, why do you actually think it’s so important? Can’t we just tick along doing what we’ve always been doing? Sure thing, you can just tick along. That’s fine. Your choice. As a fundraiser, your job is not to ‘just tick along’. Your job is to make a difference. Your job is to do the very best job you can for your donors and beneficiaries and anything less than that isn’t good enough. It might take some more thought, more time, more risk but if your organisation is going to raise more funds, engage more donors, work with more volunteers, create more awareness and achieve its mission then it has to be innovative to survive. Innovate or die. Simple as that. Your choice. This interview featured in the first flat earther newsletter last month. I thought I would also share it here just in case you missed out. As always, love to know your thoughts. This entry was posted in creativity, customer service, Enchantment, Innovation, Inspiration, passion, procrastination, Purple cow, relationships, remarkable, Twitterverse and tagged ajleon, business, cancer research, challenge, change the world, charity, creativity, entrepreneur, failure, fear, flat earth direct, fundraising, Innovation, internet, jonathon grapsas, Lego, not for profit, orange, purple cow, risky, second, seth, tick along. Bookmark the permalink. This article is on-point. So many fundraising professionals that are driven by bottom-line CEOs won’t risk incorporating new ideas. They’ll go for the tried and true methods that continue to produce results, albeit not outstanding, but consistent. Also, in a tenuous job market, people will tend to do what’s safe–and not risk anything–especially if that’s the direction from the top.